Exercise-induced pulmonary hemorrhage (EIPH) in horses (also called “bleeding”) refers to the presence of blood in the lungs of a horse after exercise. This condition has been treated primarily with furosemide, but how the diuretic works is not completely understood. A recent study has found a relationship between the medication and an enzyme in the horse that affects the pressure of the blood vessels in a horse's lungs, reports the Blood-Horse. Published in Comparative Exercise Physiology, the study potentially shows that there could be new treatment options for EIPH. Conducted at Gávea Racecourse in Rio de Janeiro, Brazil, the study took post-race blood samples from 73 horses; 43 of the horses had been treated with furosemide (250 mg). The samples were tested for angiotensin converting enzyme (ACE), a vasoconstrictor that causes high blood pressure. Horses that were treated with furosemide had significantly reduced ACE activity. 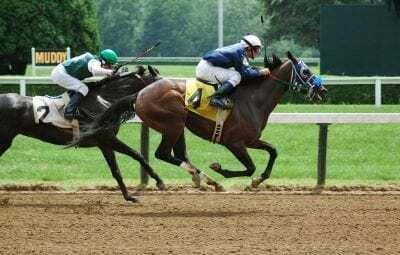 These results might impact the search for exactly how furosemide works and how it affects horses treated with it for racing. Though furosemide is the most effective means of reducing EIPH, it does not completely prevent its occurrence, with some medicated horses still bleeding. Because of this, more research is needed to find alternative treatment options. Read more at the Blood-Horse. This entry was posted in Horse Care and tagged ace, angoitensin converting enzyme, bleeder, bleeding, Comparative Exercise Physiology, EIPH, furosemide, Gávea Racecourse, treatment, vasoconstrictor by Paulick Report Staff. Bookmark the permalink.